I roll my bike out the front door and head off toward the hills. I am alone, with zero responsibility outside of coming home the following day. I ride away from the city, snaking my way through traffic, dodging under a freeway and onto quieter roads. I charge up broken pavement. I pedal my bike to the brink of no return. 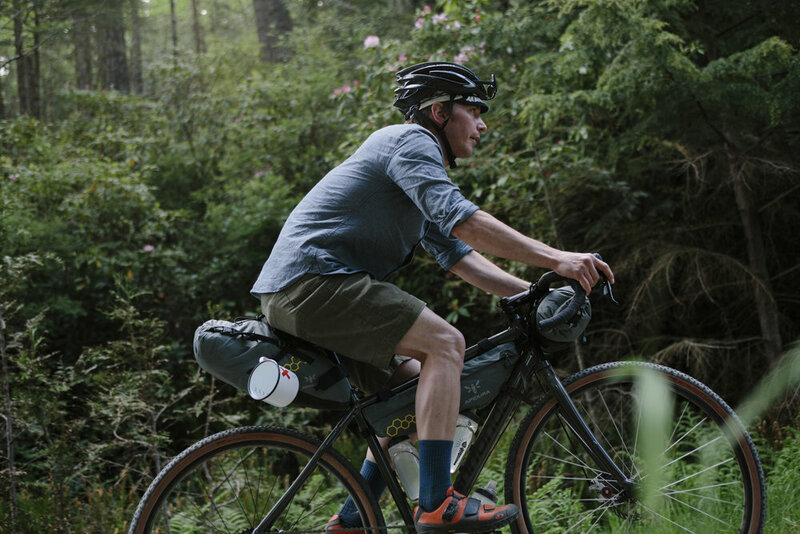 I shout a string of obscenities and direct my bike back the way I came.I was trying to ride through a series of forest roads I had never seen, on the backside of Green Mountain on the Olympic Peninsula outside of Seattle. My goal was to summit before sunset. My intentions were good. I wanted to get there without trespassing on county watershed land, again. Now I find myself stuck. I am on a rutted-out game trail. What had started as a promising paved road behind a closed gate, slowly disintegrated into a gravel road, then steep 4WD track, followed by a jeep trail and then single track. My path whittled its way down to the deeply rutted, overgrown, unrideable trail I am now on. The day’s light is starting to fade. This casual, last-minute nature suits my style just fine. I leave for less than sixteen hours and between start and finish there isn’t much I need. I pack bare essentials: something to sleep on, the makings of a meager cup of coffee for the next morning, a single can of beer, a paperback pocket Western, a headlamp and knife. That’s it; fast and light. I grab dinner and breakfast enroute, and the brevity of the trip means I am not spending much time awake — or asleep — at camp. I am an outdoor-adventure loving, work-from-home dad, where the dad part takes top priority. Most days I start work early so I can finish in time for school pickup, after which a whole host of after-school activities and various needs await to be met. Violin lessons, t-ball practice, Scouts, grocery shopping, laundry, dog walks, trips to the park, play dates. The after-work part of my day is often more difficult and tiring than the paycheck-earning part, but far more rewarding. Bikes and bike racing have ebbed and flowed throughout my life in different ways for as long as I can remember. My younger brother and I would race around the block. Those races transformed from sidewalk sprints to laps around the BMX track, where my brother eventually became faster than me. Tired of the racing structure, I left the track and became a park rat, spending every available minute in the woods building dirt jumps, or riding in the skate park. Eventually, work and school took hold and I had less time for maintaining trails and started alley cat racing, immersing myself in the fixed-gear culture. A chance encounter with cyclocross was a cupid’s arrow. I fell in love. I started training, got faster, rocketed up in category and spent a few seasons racing at the elite level, traveling all over the country for four months a year. That was until I burned out and we moved to Seattle from Chicago. We moved west for proximity to nature. Once here, I started skipping cross races to ride around in the mountains. I found a different, more fulfilling reward racing to a mountaintop to beat the setting sun. 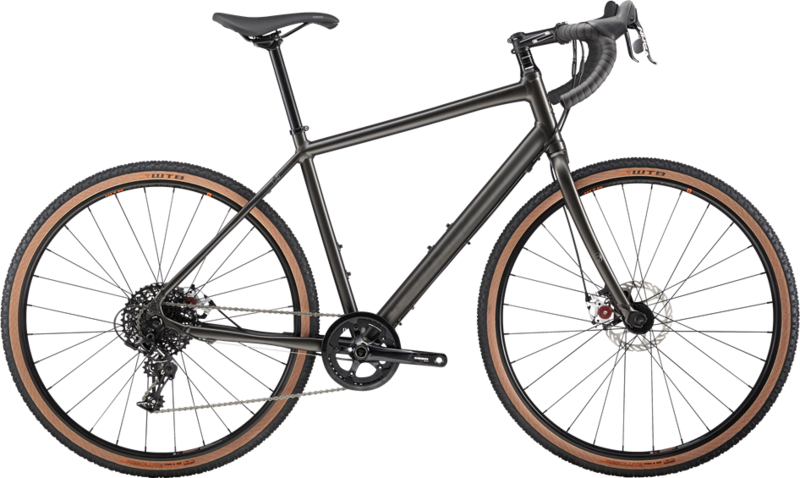 I put the fattest tires possible on my cross frame and tried not to melt the pads on my canti brakes during mountain descents; I spent days riding deep into the woods in search of abandoned mines and railroads. My six-year-old son is just about big enough to start riding the mountain bike trails with me. He can almost outpace his mom and me on the hiking trail, and I am pretty confident he will be skiing harder terrain this winter than I can. But for now, these little weeknight retreats are something I do alone. If I get slightly lost in the process, no big deal. Back on the trail, a new goal is set: I need a flat piece of ground big enough to pitch a tent. Ideally, that spot isn’t in the middle of a dirt road, or on the side of a dirt road, and it comes with some kind of view. I tuck tail and make the best of my deteriorating situation. I sway, slide and skid down the dirt. The sun descends alongside me. I reach the gate. I lift my rig over it and mentally abandon the summit attempt. At this point, disappointment and fatigue are battling for priority and it is hard to stay positive. I was out for a good time, and at this moment, a good time sounds like diving into the burrito I’ve packed, drinking my one beer and settling into my tent. I ride a few miles up the road. On a spur — a small dirt road off the main gravel road — there’s a grassy knoll with a westward facing view of the last sunlight setting over the Olympic Mountains. I set up camp. It is a simple affair for a quick night. I pitch my tent out of view from the road and lay out my sleeping pad and bag inside. With camp set, I roll over a big rock for a seat and unwrap my now cold burrito. I raise the shaken and warm beer to the sky, salute the day and devour my supper, filling my belly for a warm night under the stars. Settled in my sleeping bag, the disappointment of not achieving my goal flitters away into the stars. I enjoy this lack of competitiveness. I am never going to win when the mountain is my opponent. The climbs will never get shorter, the grade will never lessen, the gravel will never become firmer. Nature always wins, and I am okay with that. 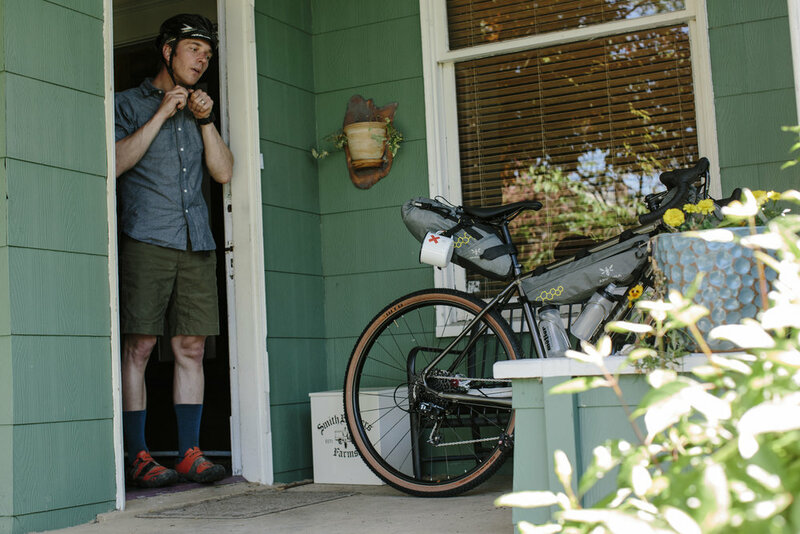 I focus only on what I need, which isn’t much — to ride until I am tired, go to sleep when I feel like it and wake up early enough to get home in time to see my son off to school. What kind of camping do you do with your kid? Mostly backpacking. He is six years old. We started backpacking with him when he was four, so now he can walk quite a bit. In the last year or so, it’s become really rewarding with him — we can go seven miles into the wilderness, up into the mountains and pitch a tent and be out in the middle of nowhere and then wake up the next day and keep going. What does the packing list include? It’s all normal stuff. Sleeping bags, a tent, food, a poop shovel and some toilet paper. He carries his sleeping bag and sleeping pad now, but he’ll always bring a stuffed animal or two and a few books to read. And snacks. Snack stops are imperative with a kid. We don’t go fast. He hikes between a mile and two miles an hour. So it’s all day. But it’s just like going out on a long bike ride, it’s what you’re out to do. It’s what you’re doing. It doesn’t matter how fast you go, because you’re out to do it. Why is it important for you to get him in the outdoors? I think it’s good to give him a broader understanding of how things work. To have appreciation for things we can’t control. To not be comfortable all the time. To earn something. He’s proud of himself when he gets to places. Mostly, though, it’s just to do it. To get out. It’s also the type of family we are. We don’t go to church, we go camping. How is it to go out on your own versus camping with the family? On my own it’s fast and light, but I miss the family almost from the first pedal stroke. I work from home and I take care of my kid. When I’m not around him, it’s weird for me. But it also feels so good to move at my own pace. Can slowing down be a perk? Definitely. When going from a car to a bike, you get to see so much more. You see stuff that you would have never seen in a car. When you get out with your kid, and every puddle is something to play in and stop for, you get to see even more of the minutiae of what’s around you, because you have way more time to look. When I get out on my own, I move at a significantly faster pace and I don’t look at every little waterfall. When we’re with the kiddo, we look at every waterfall. And that’s awesome. Any advice for someone taking their kid(s) into the woods? Lots of snacks. And stop when they ask for them. We didn’t do that at first. We wanted to go our pace. We wanted to go our distance. We had this idea of what needed to get done. And then we realized that regardless of what our goal was, we were not setting the pace, ever. And once you realize that you have to stop every mile or every half mile to have a rest and a break — when you accept that that’s the pace — everything is a hundred times easier. So we had to practice slowing down. Because once you slow down you get there. But if you’re just trying to push through and rush it, he’s not going to make it. And then he’s not going to like it. You have to make sure it’s fun. If it’s not fun they’re not going to like it and they’re not going to want to go back. So lots of snacks. It’s all about snacks. Every cyclist has that one trip - certain climbs, views and moments that outlast others. When we saw what was on the table riding from Bergamo to Munich we knew this would be ours to keep forever.